Adding leafy greens to your morning smoothie is one of the easiest ways you can increase the nutrient density of your breakfast to support optimal health and wellbeing. If you’re looking for weight loss inspiration or if you’ve got other family members to keep healthy, our delicious green smoothie recipes are perfect for getting the whole family excited about eating leafy greens, so you can reap their health benefits on a regular basis. So having a green smoothie for breakfast is always a good idea! Keep reading to learn how to make the best green smoothies that are awesome for you, and actually taste good too. 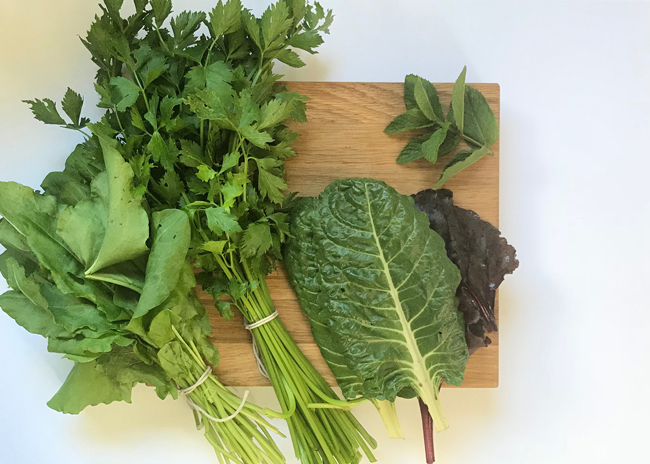 Kale and spinach are two of the most common leafy greens used in smoothies, however you can experiment with any greens you have available - silverbeet, rocket, romaine (or other lettuces), watercress, beetroot leaves, or even microgreens. You can also make green smoothies with herbs, such as parsley, coriander or mint. These herbs taste great when blended with citrus fruits like lime, lemon or orange. If you’re trying a green smoothie for the first time, I recommend using kale or spinach and following one of the recipes below. The natural earthy flavour of these greens can easily be disguised in a smoothie when you have the right combination of ingredients. The green smoothie recipes below are examples of recipes that you can expect in a Craft Smoothie box. Every smoothie box includes 2 different green smoothie recipes, making it super easy to integrate leafy greens into your diet each week. Each recipe makes 2 large green smoothies. You can make these green smoothies in a NutriBullet or conventional-style blender. 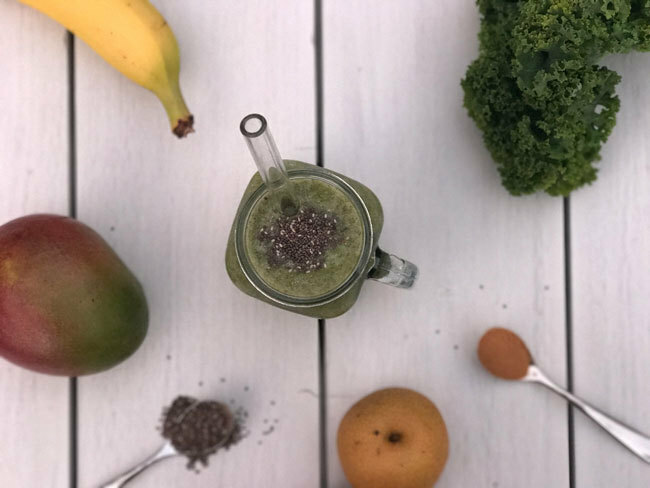 Here's a detoxifying green smoothie that's the perfect low calorie, high fibre and nutrient-rich breakfast option to support your digestive health and strengthen your immunity. Crafted with pear and ginger, it's packed with antioxidant and anti-inflammatory benefits and the linseed delivers a heart-healthy serving of plant-based fats and protein to help keep you fuller for longer. 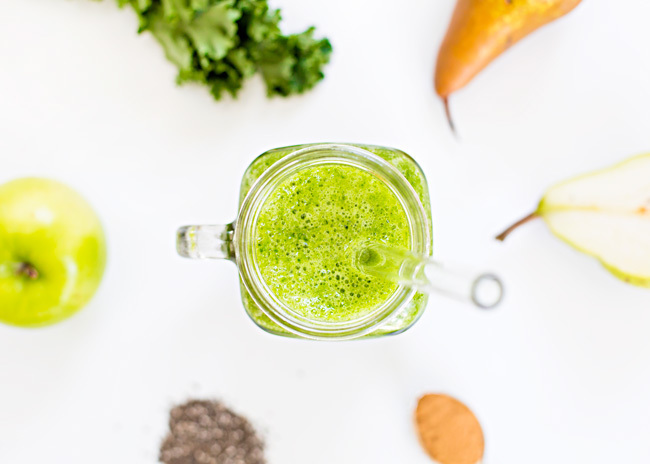 Try this delicious green smoothie recipe for an energising breakfast that's bursting with antioxidants and a powerful source of essential vitamins, minerals, nourishing fats and protein. And we can’t go forgetting the immune-strengthening and metabolism-boosting benefits of lime! Full of fibre and packed with protein, chia seeds will set your day right! As for antioxidants, that’s where the nashi, mango and cinnamon come in! They combine perfectly with kale to create a refreshing green smoothie that you'll want to get out of bed for! 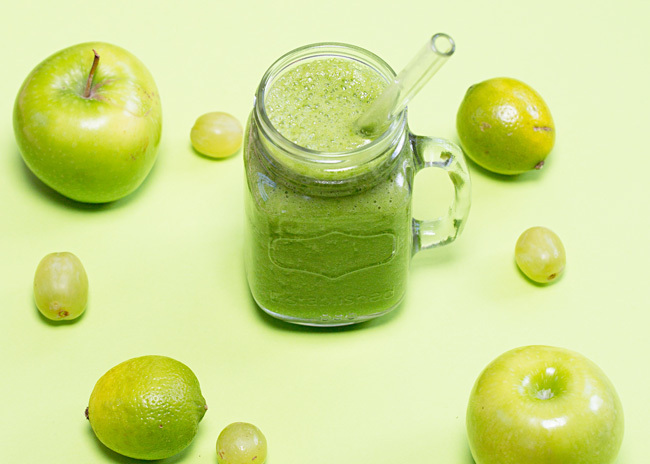 Cheers to fighting free radicals and protecting your immunity with this antioxidant-boosting Granny Smith and grape blend! You can count on the kale to turn on an awesome source of fibre to support your body’s detoxification processes and the almonds and chia seeds for a satisfying serving of healthy fats and protein to sustain your energy levels. Why is are green smoothies healthy? Because green smoothies are made with leafy greens which are packed with beneficial antioxidants, vitamins, minerals and dietary fibre, they are the perfect option for enjoying a nutrient-rich meal that satisfies your hunger and supports optimal health. Adding leafy greens to your smoothie is an easy way to enhance the nutrient levels of any recipe, however some smoothies taste better with leafy greens than others. The good news is that you don’t need to have a green smoothie every day to enjoy the benefits of a diet rich in leafy greens. It’s important to rotate your smoothie ingredients so you’re getting a varied nutrient intake and if you’re not having leafy greens in your breakfast smoothie, aim to have a serving for lunch or dinner (or both). Which vegetables can I add to a green smoothie? You can add any vegetables to your green smoothies - try experimenting with different ingredient combinations to learn which vegetables make a tasty addition to your favourite smoothie recipes. Vegetables like cauliflower, zucchini or cucumber are great to experiment with as they have a mild flavour that won't overpower the other ingredients. Can a green smoothie replace a meal? Green smoothies are often recommended as meal replacements for breakfast as they serve as a nutritious option that can be tailored to your unique health requirements. Including a source of healthy fats and protein, using ingredients like avocado, nuts, seeds or wholefood protein powders, will help ensure that your green smoothie is filling and nutritious. Find out how to use superfoods in smoothies to make well balanced breakfast smoothies. Why drink a green smoothie? Drinking green smoothies is a convenient way up your nutrient intake and help curb cravings for foods that don't nourish you, which can in turn be effective for supporting weight loss. Having green smoothies is the easiest way to introduce more leafy greens into your diet, so you can enjoy their numerous health benefits more regularly. When to drink a green smoothie? Breakfast is the best time to drink a green smoothie because it's a convenient way to satisfy hunger and ensure your body gets the fuel it need to support your productivity and positivity as the day progresses. Learn more about how to ensure your morning routine sets you up for success. What is green smoothie cleanse? A green smoothie cleanse or detox involves introducing green smoothies into your diet to assist with supporting the body’s natural detoxification processes. A green smoothie detox may involve only drinking green smoothies for certain period of time, or introducing a green smoothie as a meal replacement on a regular basis (but not for every meal). You can read our recommendations for how to detox your body naturally here. All of our recipes are paleo when blended with a liquid base like water, coconut water, nut milk or almond milk. Green smoothies made without dairy, grains or refined sugars are typically paleo-friendly. How to make green smoothie for weight loss? To make a green smoothie for weight loss, combine leafy greens with your favourite fruit, superfoods, ice and a liquid base. To reduce the calorie content of your smoothie, you can use a low calorie liquid like water or coconut water. Check out our best weight loss smoothie recipes. Want to make healthy green smoothie recipes at home without the hassle of sourcing your own ingredients and superfoods? 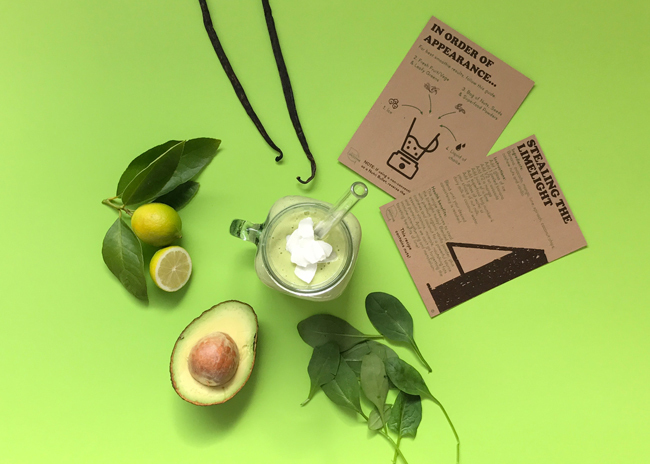 Give a Craft Smoothie box a try and we'll send you everything you need to make quick and easy homemade smoothies to support your overall health and wellbeing.